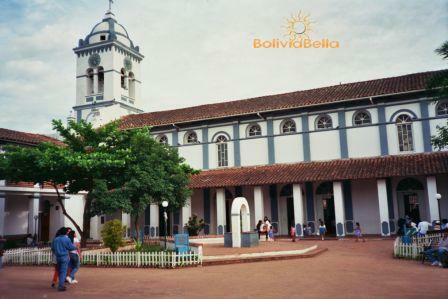 Cotoca, in Santa Cruz Bolivia is known for its December 8th pilgrimage. Cotoca is a small town of Guaraní origin located to the East of Santa Cruz, Bolivia. The town is best known for its pottery shops as its ceramic artists are very highly skilled. It is also famous among Bolivians for its Fiesta de Cotoca, held each year in early December. Cotoca, Santa Cruz Bolivia Slideshow: BoliviaBella.com’s trip to Cotoca (near Santa Cruz) was created with TripAdvisor TripWow! You would pass through Cotoca if you take the Jesuit Missions tour because it's one of the first towns you'll come upon when you leave Santa Cruz in that direction. Cotoca's central plaza and its church are its main attractions. The Sactuary of the Virgen de Cotoca (locally called Mamita de Cotoca or, Little Mother of Cotoca), a parish run by Dominican priests, is a beautiful colonial-style church located on the central plaza. Each year on December 8th, devout Catholics take part in a pilgrimage by foot to Cotoca. As the Virgin of Cotoca is believed to have the ability to perform extraordinary miracles, hundreds walk the entire 17 miles from Santa Cruz to Cotoca hoping that in exchange for their efforts, she will grant them their prayers. Many, in penitence, crawl on their hands and knees all day and night until they reach the church, where they light candles and pray. Others, upon purchasing a new car, take their car to the Sanctuary of Cotoca on Sundays to be blessed by the priests. Cotoca is the entryway to the Department of Beni and the Chiquitania region, where 400 years ago Jesuit priests attempted to convert the Chiquitano and Guaraní natives to Catholicism and established Jesuit Missions. It takes about 35 minutes by car, or 50 minutes by bus to reach Cotoca from downtown Santa Cruz. When you arrive, visit one of the many pottery stores, most of which display their goods along the town sidewalks. Buy a colourful hammock, or spend some time in the central plaza, around which you will find small restaurants and vendors selling regional handcrafts. Cotoca is also very well-known for its sugarcane molasses (called "miel") which is sold in small ceramic pots, as well as other baked and candied goods. Put this Cotoca puzzle together to see the photo. Upon entering the town you'll come to a "rotonda" which is a little round plaza with a giant statue of a lady with some pottery. If you turn there to the right instead of heading forward into town, you'll find a little pottery shop on the right side about 1/2 block from the rotonda. The owner is really nice and she'll let you in and have her potter give you a demonstration of how the pottery is made, shaped and dried in the kiln. See our Cotoca photo gallery for more. You can visit Cotoca easily in one morning or one afternoon. By radiotaxi, the cost to Cotoca from the center of Santa Cruz is usually about Bs. 45-50. On your way to Cotoca you'll pass by the Jardín Botánico (Botanical Garden), El Potrero (a small but really pretty outdoor restaurant with swimming pool) and also Madre Selva (another GREAT outdoor restaurant and swimming pool). In order to really enjoy your day outdoors, you could start with a trip to Cotoca in the morning, then eat lunch at El Potrero or Madre Selva, maybe a dip in the pool, and then complete the day with 2-3 hours at the Botanical Gardens. All of these places are worthwhile visiting. You can see them all in one day.